Dr Mohamed Jama, Assistant Director-General for General Management at WHO introduced WHO's Twelfth General Programme of Work (GPW) 2014–2019 as plenary began on Wednesday morning. He explained that the document is still a draft, requiring additional input from Member States, but that it has been developed as an integral part of programmatic and management reform. The overarching objective of the draft GPW was to align predictable funding to outputs agreed by countries. In contrast to previous GPWs that set a global health agenda for all, the twelfth establishes a strategic, results-based and accountable framework for the work of WHO. It provides a six-year vision for the organization, with a reduced number of categories and criteria for priority setting: five programmatic categories and one administrative from a previous total of thirteen. The six categories are: communicable diseases, noncommunicable diseases, promoting health through the life-course, health systems, preparedness, surveillance and response, and corporate services/enabling functions. The draft document also explains clearly what WHO plans to do specifically for each of the current 26 priorities stemming from the categories. Many countries took the floor to discuss the draft GPW document. The general consensus was that the document was a positive step in making WHO more efficient, effective and accountable. Member States also expressed their concerns, however, about the distribution of funds and the resources allocated to the WHO European Region. They asked for an explanation of the rationale behind choosing the 26 priorities and questioned whether this was too ambitious. One Member State commented on the tension between ensuring national priorities were reflected in the GPW, and keeping it achievable. Delegates requested more information on how the tasks and work would be shared throughout WHO, and the budget needed to undertake specific tasks for each priority. 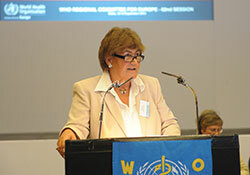 Dr Margaret Chan, WHO Director-General, noted that the 26 priorities had been set by Member States at the World Health Assembly, but explained that her role was "to listen to the debate in six regions, and then maybe axe something, add something or improve the language to show clarity". The Director-General underlined that she was not asking for more funding, but was working to ensure that what is received is used in the best way and that WHO becomes a results-based management organization. Dr Chan appealed to recipient countries to make their voices heard, as the debate has been led by donor countries. Dr Mohamed Jama described the programme budget as the biennial expression of the GPW: it indicates in more detail than the GPW what outputs WHO will deliver each biennium. Only once agreement is reached on these outputs, can the discussion move on to the level of the organization at which they should be delivered, what this will cost and what budget will be allocated. Imre Hollo, Director of Administration and Finance at WHO/Europe, pointed out that WHO/Europe was the forerunner among regional offices in identifying key and other priority outcomes as a basis for its programme budget. In presenting the proposed programme budget for 2014–2015, he explained that some assumptions had to be made, such as the likely biennial budget, and that fixed costs such as staff salaries would be slow to change. He also described WHO/Europe's business model: intercountry work as the default using technical resources pooled at the Regional Office level, followed by multicountry work whenever a group of countries share common issues, and then country work when that is the best option. Erik Blas, Programme and Resource Management at WHO/Europe, confirmed there was still more work to be done in aligning the outcomes of WHO/Europe's work to the six agreed categories and identifying the outputs needed to achieve them, and summarized some of the expected shifts in emphasis in those categories. Member States were asked to consider whether the priorities were the right ones, whether the business model was the correct one, what the division of labour should be between the three levels of the organization (headquarters, regional and country), and how they viewed the funding issue. A speaker for the Standing Committee of the Regional Committee was echoed by many delegates when she expressed concern about the logic of reviewing a budget without any funding, but conceded that the reasoning and context behind this approach was now clearer. It was agreed that making new priorities might well require "sunsetting" other priorities, but that greater efficiencies and effectiveness, more concentration on implementation of existing guidelines and resolutions, and better organized approaches to resource mobilization would all contribute to what WHO Director-General, Dr Margaret Chan, described as the goal of "living within our means". the importance of priorities being set by Member States and the World Health Assembly, not by donors providing voluntary contributions. Introducing this lunchtime technical session, Dr Agis Tsouros, Head of Policy and Cross-cutting Programmes and Regional Director's Special Projects, explained that as Health 2020 is a political document, targets will help to define its direction and what it should achieve. "Collecting information from different sectors and countries is also a 'catalyst for collaboration,'" he added. Much work has already been undertaken in identifying and shortlisting targets for Health 2020. Dr Claudia Stein, Director of the Division of Information, Evidence, Research and Innovation, guided delegates through the process and consultation that have taken place so far. A long-list of 51 high-level targets has been condensed to 6 overarching regional targets endorsed by the Standing Committee of the Regional Committee. Dr Stein underlined that the targets should use existing, available health information as much as possible, and that they would be regional targets, not national ones, and therefore reported at the regional level as a regional average. Countries and representatives from nongovernmental organizations attending the briefing expressed their support for targets for Health 2020. Several Member States reported on the development of national targets to complement their national strategies. WHO/Europe will now reconvene the expert group that has guided the process so far, and after further broad consultation the final indicator list will be presented to the Standing Committee and submitted to the sixty-third session of the WHO Regional Committee for Europe for adoption. Dr Manfred Huber, Coordinator of Healthy Ageing, Disability and Long-term Care, set the scene for discussions on the strategy and action plan, explaining that the median age of the WHO European Region is already the highest in the world, and the proportion of people aged 65 and over is forecast to almost double between 2010 and 2050. Dr Huber underlined that increasing life expectancy is a victory. He shared a vision for the Region where older people live with dignity, with access to high-quality health and social services, and are socially engaged in their communities. geriatric and gerontological capacity-building among the health and social care workforce. The priority interventions were chosen so that they would be relevant to countries at different starting points, incorporate "'quick wins", implementable within a short time span and under current fiscal constraints, and complement the work of partners, added Dr Huber. Over 40 countries in the Region have national strategies and policies along these lines, and WHO's role will be to support Member States in sharing good practices, and identifying and filling the policy gaps, he concluded. During the subsequent plenary discussion, Member States commended WHO for developing the strategy and action plan in line with the Health 2020 policy framework and aligning it to European Commission initiatives. Due to amendments submitted by the European Union to the draft resolution, further discussion was postponed until tomorrow. a renewed strategy on geographically dispersed offices.